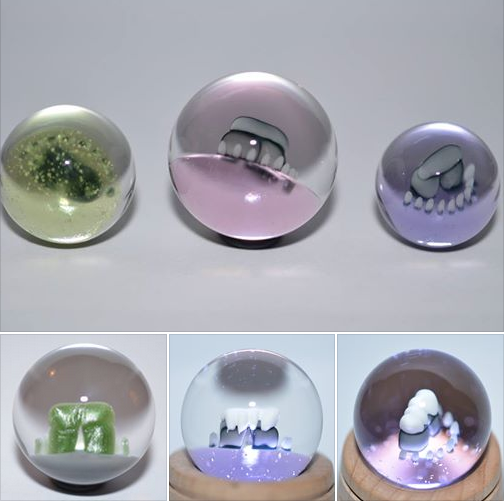 The Fabulous Stonehenge Marbles: Perfect Gift for that Friend Who Blogs about Stonehenge Replicas! A Stonehenge marble, yes, at Stonehenge! And although these beautiful creations are more than enough, he doesn’t stop at Stonehenge. Above we see: “Stonehenge Past and Present, Avebury, Stones of Stenness, Carnac, The Great Wall of China, Egyptian and Aztec Pyramids, the Parthenon, and [not sure whether to say “sadly” or “of course”!—CH] a Moai.” He has even done a Stonehenge marble with an Easter Island moai hidden in the glass at the bottom, in a fine (?) tradition long established among Stonehenge replica creators! 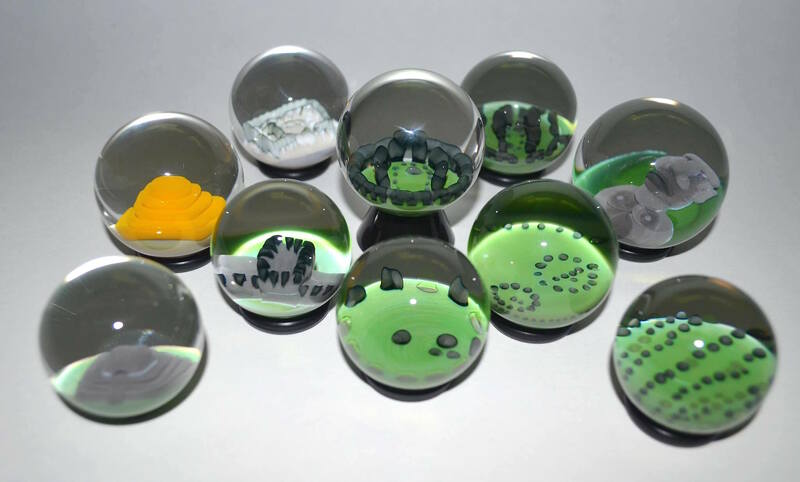 Stonehenge marbles may show the monument either as it currently exists or as it is thought to have been originally. Be sure to have a look at this video of a marble that was auctioned off just recently! *wipes drool from corners of mouth* Heh. Excuse us. That video, tho. There seriously are not enough druids in the world to award for these things. In closing, we hardly need point out that winter solstice and the Christmas holiday are almost upon us, and we know you’re all wondering what to buy for that hard-to-please but much adored Stonehenge replica blogger on your holiday gift lists. Let us make it easy. Why not order a custom Stonehenge marble (no moai necessary!)? We guarantee it’s bound to please, and think of the satisfaction you will gain from supporting an original artist instead of spending the hundreds you were planning to spend on bric-a-brac. 😉 Everyone wins! We heartily wish a very happy solstice to all of our readers, and a happy holiday season to everyone. Until the next time, very close and very generous friends, happy henging! As we know, not everyone is content to have Stonehenge an ocean or even a few miles away. The many ways of supplying your Stonehenge fix include virtual Stonehenges, large private Stonehenges, large public Stonehenges, pre-made fabricated mini-Stonehenges and then there are the homemade mini-Stonehenges. Where there is so great a need, teachers are bound to spring up. This one caters especially to the younger set of henge addicts, setting them up for a lifetime of henging! They also explain the lintels and there’s this nice little moment when their colouring the salt clay where they simply say, “Color your clay or dough by adding a bit of black acrylic paint or poster paint. Add a tinge of blue if you like.” (Our emphasis) They don’t mention bluestones, but that they throw that in, even though it’s for the sarsens, is nice. They also discuss the trilithon horseshoe at the bottom of the page, for the advanced neophyte henger. Not bad! So we’re going along, showering them with adoring approval when what do we see? Say it ain’t so!! Yes, they are moai! Groan. Now many of our multitude of readers may have joined us too recently to remember, but the association of Stonehenge and moai is kind of a pet peeve of ours. True, in this case they are at least on separate pages, but this has opened old psychological wounds and we are now curled up in the fetal position dictating this to the cat! Score: 6 druids! We like that it’s instructions for kids. Everyone should know several ways to create a Stonehenge in a pinch! That’s it for now, so until next time, happy henging! AND SEND TUNA!!!! Takino Stonehenge With a Buddha—in Japan! Yokoso! (Welcome!) On Japan’s northern island, Hokkaido, the Makomanai Takino Cemetery Park hosts, among other impressive stone sculptures, a full sized Stonehenge replica. A striking element of this replica is that the ditch and bank that make Stonehenge a henge have been included. See the bottom photo at this link. Nicely done! Of course, the authentic feel ends in the middle, at the Buddhist shrine. There’s also a giant Buddha nearby, and a row or two of Easter Island moai. See them there? They and Stonehenge often seem to end up hanging out together. We can think of five replicas we’ve posted or linked to that had moai, too. ( Texas Stonehenge II, Raven Hill Discovery Center in Michigan, Harry Rossett’s in Indiana, Kennewick in Washington State, and someone’s Obama Gardens of Hope. There may be others.) Weird, considering the originals are on opposite sides of the world, but okay, we’ll go along with it for now. Do you think it looks like a pretty gaudy cemetery? But not everyone wants to rest in piece, right? Some are hoping to rock on! It’s a great replica: made of real stone, cut unevenly (leave it to the Japanese to get it that cutting the stones in perfect rectangular prisms detracts from the monument! ), bluestones included, ditch and bank included. It is true that they may have added things here and there. There probably wasn’t a buddha in the center 5000 years ago, but there may have been a shrine. Who knows? Score: 8 druids. We would give it more if it weren’t rubbing shoulders with the moai and the huge Buddha. Good ambience requires space. What a replica! Maybe we should have saved it for Clonehenge’s one year birthday, which is coming up soon. We’ll end with a sentence we like from a Google Translate page of a blog post about a trip to this cemetery. (Google Translate makes us lol!) “Why the road to heaven is like this?” A koan to ponder . . .
“At present our Stonehenge replica contains just the ‘bluestones’ of Stonehenge,” a note from Raven Hill tells us. Although it may look like a simple stone circle, great care has gone into stone placement, and the heel stone, altar stone and inner horseshoe are all represented. It is part of the 30-acre Ancient World section of RHDC, which includes this Stonehenge, a Mayan ball court, an obelisk, a house foundation as from Skara Brae, and other things including–but of course!–a moai, or Easter Island head. Now normally we lightly mock the moai/Stonehenge combination, using the penguin/polar bear analogy used here before, but we will cut Raven Hill some slack. We know it isn’t easy to attract the attention of the young. You might say Stonehenge and the moai are the Brad Pitt and Angelina Jolie of stone monuments. If you’re trying to reach kids, what could be better than putting both on the cover of your magazine, so to speak? * And including Skara Brae is a point in their favour! Score: 5½ druids for the care and knowledge that went into this replica, despite no trilithons or ditch and bank. Raven Hill looks like an excellent place for a family day or several family days a year. See the comments for more info on this interesting and informative place! *This does not let other Stonehenge/moai combiners off the hook. Sorry! Found this bit and had to pass it on. Click on the link above or the picture to see full instructions on how to do sponge sculptures. We agree with them: if you’re learning sculpture, why wouldn’t it be Stonehenge or and Easter Island head you started out with? Or preferably both! It’s a nice little model they have there. We would give it 6 druids at first glance. After all, doesn’t everyone want a Spongehenge?! If you decide to make one, please keep us in mind! Hint: how about rainbow colours? Of course, we aren’t looking at anything like the stone-by-stone detail of the Cardboard Stonehenge kit shown on the Cardboard Stonehenge blog, a great read featured here earlier. At the other end of the spectrum is this (to us) humourous item, in which you just cut out all but the base of the ‘stones’ and stand them up, made by a company with the evocative name L’Instant Durable. Ah, if only it were! Still, this is an impressive model and if we’d had one we might have kept busy making it and avoided the embarrassment of starting Clonehenge. Alas for the world–one annoyance that might so easily have been averted! Paper Landmarks‘ Stonehenge score: 7½ druids. Note that you can get it in several colours including gold, although why you wouldn’t choose the stone colour is beyond us. Unless you were just going to set it on fire anyway. In that case, do it safely! And send us pictures!